War. What is it good for? Well, if new use of technology by the US Navy has anything to do with it, finding Pirates for a start. By upgrading its existing Fire Scouts with new 3D laser imaging tech, it's hoped that the drones will be able to recognize the small ships used by these unscrupulous seafarers. The system, known as LIDAR (Light Detection And Ranging, also known as LADAR) uses millions of laser pulses reflected off an object to create the three-dimensional image, which could then referenced against known pirate ships from a database. Ultimately, human operators will make the final call, to avoid any ED-209 style mis-understandings. That said, if you're taking the dingy out past the Californian breakwaters this summer, you might want to keep the stars and stripes in clear view, as that's where the Navy will be running its initial trials. 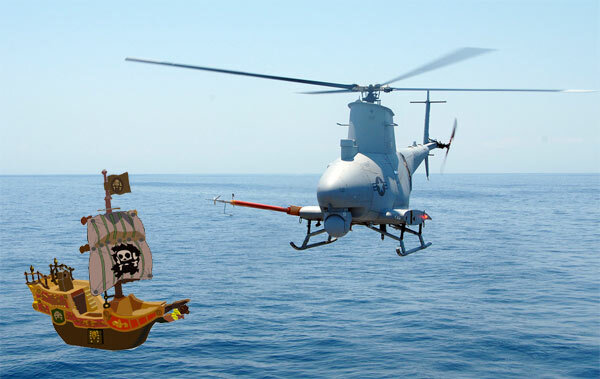 US Navy Fire Scouts will automatically spot pirates, give 30 seconds to comply originally appeared on Engadget on Sun, 08 Apr 2012 09:24:00 EDT. Please see our terms for use of feeds.